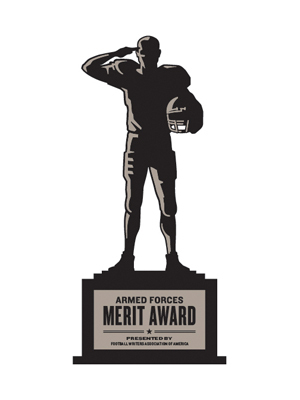 FORT WORTH, TEXAS (FWAA) – U.S. Marine veteran Steven Rhodes, a senior defensive end at Middle Tennessee State University, is the fifth recipient of Armed Forces Merit Award presented by the Football Writers Association of America (FWAA). ESPN Events, a division of ESPN, owns and operates a large portfolio of collegiate sporting events worldwide. The roster includes three Labor Day weekend college football games; FCS opening-weekend game; 13 college bowl games, 11 college basketball events and two college award shows, which accounts for approximately 250-plus hours of programming, reaches almost 64 million viewers and attracts over 700,000 attendees each year. With satellite offices in Albuquerque, Birmingham, Boca Raton, Boise, Dallas-Fort Worth, Honolulu, Las Vegas, Montgomery and St. Petersburg, ESPN Events builds relationships with conferences, schools and local communities, as well as providing unique experiences for teams and fans. ESPN Events also manages the Big 12 Corporate Partner Program. Collegiate Football - AdvoCare Texas Kickoff (Houston); AdvoCare V100 Texas Bowl (Houston); Air Force Reserve Celebration Bowl (Atlanta); Birmingham Bowl (Alabama); Boca Raton Bowl (Florida); Camping World Kickoff (Orlando, Fla.); Famous Idaho Potato Bowl (Boise); Gildan New Mexico Bowl (Albuquerque); Hawai’i Bowl (Honolulu); Las Vegas Bowl (Nevada); Lockheed Martin Armed Forces Bowl (Dallas-Fort Worth); MEAC/SWAC Challenge (Baton Rouge, La. ); Montgomery Kickoff Classic (Montgomery, Ala.); Popeyes Bahamas Bowl (Nassau); Raycom Media Camellia Bowl (Montgomery, Ala.); St. Petersburg Bowl (Florida); The Home Depot College Football Awards (Atlanta) and Zaxby’s Heart of Dallas Bowl (Dallas-Fort Worth). Collegiate Basketball - AdvoCare Invitational (Walt Disney World Resort near Orlando, Fla.); College Basketball Awards Presented by Wendy’s (Los Angeles); Gildan Charleston Classic (South Carolina); Hawaiian Airlines Diamond Head Classic (Honolulu); Jimmy V Men’s Classic presented by Corona (New York City); Jimmy V Women’s Classic presented by Corona (Uncasville, Conn.); NIT Season Tip-Off (Brooklyn, N.Y.); PK80 (Portland, Ore.); State Farm Armed Forces Classic (Honolulu); State Farm Champions Classic (New York City); Tire Pros Invitational (Orlando, Fla.) and Wooden Legacy (Orange County, Calif.). For more information, visit the official website, Facebook, Twitter or YouTube pages. The Football Writers Association of America consists of the men and women across North America who cover college football for a living. Founded in 1941, the membership includes journalists, broadcasters and publicists, as well as key executives in all the areas that involve the game. The FWAA works to govern areas that include game day operations, major awards and an All-America team. Through its website, the FWAA works to improve communication among all those who work within the game. The FWAA also sponsors scholarships for aspiring writers and an annual writing contest. Behind the leadership of President Mark Anderson of the Las Vegas Review-Journal, Executive Director Steve Richardson and a board of veteran journalists, the FWAA continues grow and work to help college football prosper at all levels. There are now over 1,300 members.